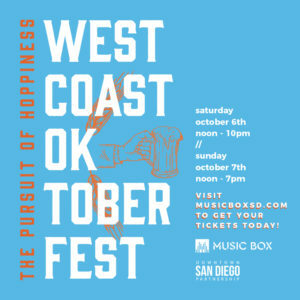 West Coast Oktoberfest “The Pursuit of Hoppiness” is coming to Downtown’s Columbia District! Hosted by Music Box, this 21+ event will feature traditional German music, booths serving up Bavarian pretzels and bratwursts, themed contests, and will have plenty of beer to go around. You can even purchase your own stein to bring the party home! VIP ticket perks include: access to Music Box’s indoor amenities such as a full bar, plush and air-conditioned seating, an outdoor terrace overlooking the event, and one Hoppiness Pass per VIP guest, which includes one free beer. Work by day. Fun by night.